The Market Trend Model (data sheet) moved to a neutral bias on Friday when the stock market posted its biggest one day reversal in four years. At least for the moment it appears the sellers of stocks are all sold out. I would expect a natural "reaction rally" to occur over the next few weeks with the market indexes drifting higher into areas of resistance. 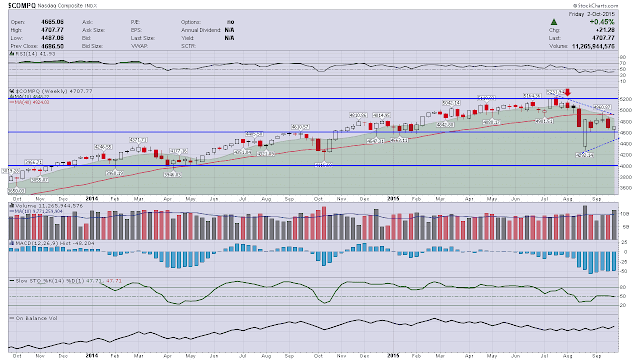 The major indexes (like the Nasdaq chart below) now appear to have clearly defined levels of support and resistance. For weeks the weekly and monthly time frames have been showing a stock market under distribution. At the moment these time frames show the stock market has stabilized at current price levels ~ how long the current price areas remain a level of support is yet to be determined. 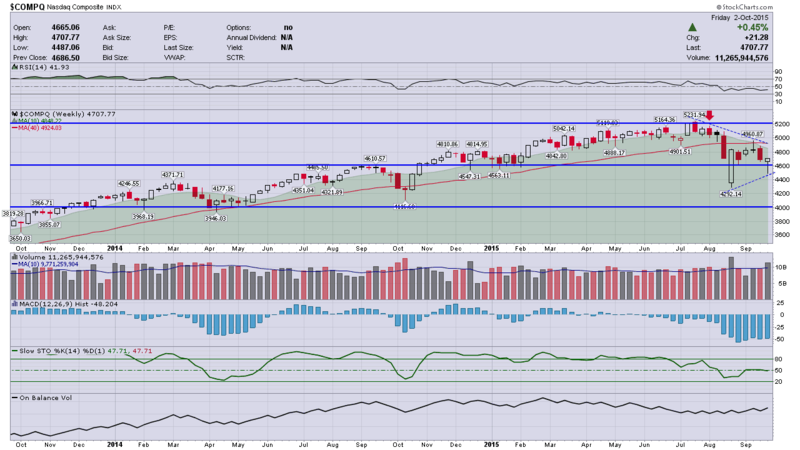 The Nasdaq (weekly chart) shows 4,925 as an area of resistance, the Nasdaq-100 (weekly chart) shows 107 as an area of resistance, the S&P 500 (weekly chart) shows 2,060 as an area of resistance, and the Russell 2000 (weekly chart) shows 120 as an area of resistance. The $1 question is whether the U.S. economy can accelerate into the 4th quarter AND take the stock market with it. Favorable seasonality trends favor higher equity prices in the coming weeks. However, slowing economic growth around the globe and a credibility crisis at the U.S. Federal Reserve are definite obstacles for a substantial and sustained stock market rally. 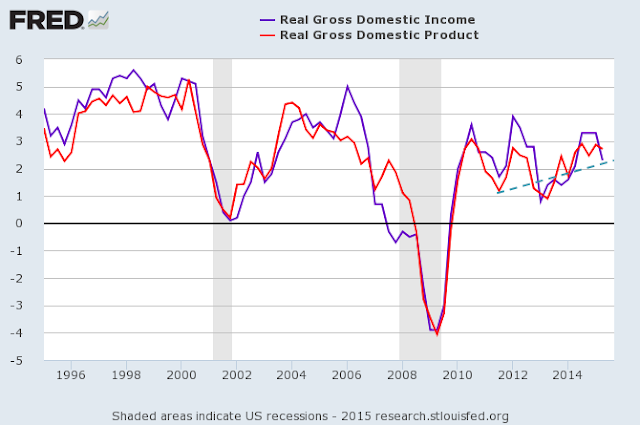 The fundamental case for lower equity prices as a result of slowing economic growth can be seen in the two charts below. 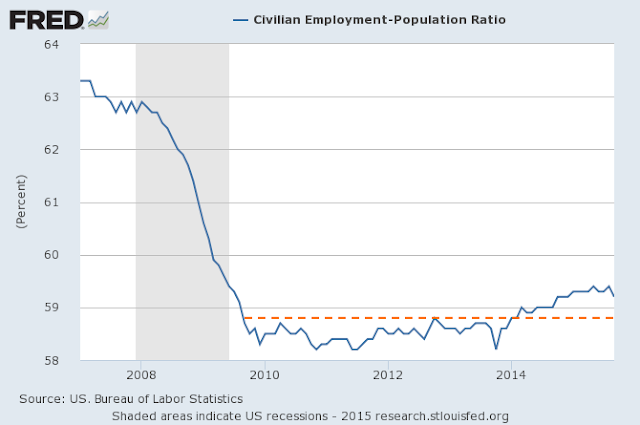 The GDI-GDP Ratio and the Civilian Employment-Population Ratio show a weakening economy and a weakening labor market. Stock market traders will surely be asking "Where's the beef?" when the next set of economic data are released (economic calendar). While the recent stock market sell off appears to have run its course for now, it remains to be seen how much of a technical bounce the markets can produce in the coming days and weeks. As always I remain mindful that anything can happen from one day to the next.